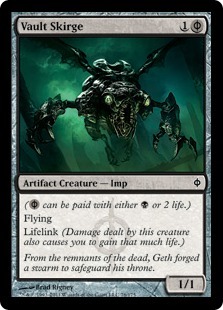 The swarms of Phyrexia return! I last spoke about them in my Invasion post. 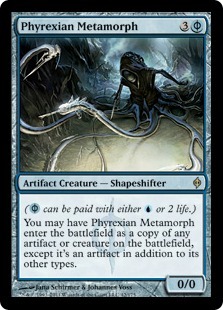 New Phyrexia was the third set of the Scars of Mirrodin block. 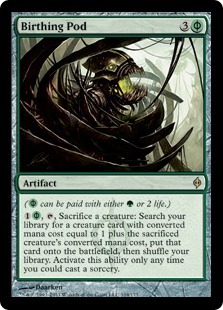 The only returning character from that long ago war is Karn, who had created Mirrodin, but also introduced the Phyrexian oil that began to slowly corrupt its denizens (correlating directly to those creatures and tribes first introduced in the original Mirrodin block — Leonin, Loxodon, Vulshok, Auriok, etc etc). Karn lost his way, becoming corrupt himself, and transformed into the Father of Machines, building and leading Phyrexia. Another war was waged, the Phyrexians attempting to assimilate the metal plane entirely, the Mirrans doing all that the could to stop them. In the end, however — despite the planeswalker Venser sacrificing himself to restore Karn — it wasn't enough and New Phyrexia was born. New Phyrexia was both a significant and ironic point in Magic for me. It marked my first major return to playing the game outside of a very limited casual experience. I played at Friday Night Magic (FNM) events, Pre-Release/Release events, Pro Tours (PTs), and making new friends all the while! 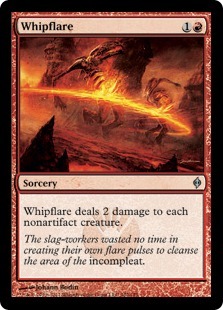 The ironic aspect was the fact that I quit before the original Mirrodin released, disliking the artifact heavy theme and introduction of "Indestructible" which I thought was too powerful at the time. Years later the power creep was way more compounded than back then. Not only that, but my "go to" deck was Tempered Steel (one of my favorite cards), which was predominantly artifacts, though I did tweak it some from full on aggressive to what is considered mid-range. The set didn't really offer any new mechanics, just revisiting the others present in the block (Imprint, Infect, Living Weapon, Metalcraft, and Proliferate, BUT it did introduce Phyrexian Mana! This mana existed in each of the five colors of magic and allowed players to spend either one of the specific color, or 2 life, for each Phyrexian Mana cost. This made it possible for many of the cards featuring this new cost, to be playable and splashed in a multitude of decks, as they technically weren't strictly color-demanding. The new mana was a nightmare for Wizards of the Coast at the time and deemed overall a design mistake on their end. Cards with Phyrexian Mana are still being banned from formats to this day! Personally, I loved it! Still do! Also, Karn was brought back to the game as the first colorless planeswalker ever printed. He's still fairly popular in decks today! 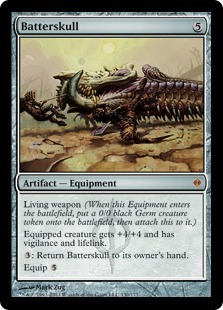 Yeeeeeeeeep, lots of artifacts and Phyrexian Mana there! New Phyrexia drew me back into the fold, buying boxes upon boxes of product, although I did eventually escape again a few blocks later, because the cost of Standard was a bit too rich for my blood. Do you currently play Magic: The Gathering? Are you a fan of New Phyrexia? If so, what's your favorite card and/or ability/mechanic from the set? Did you like that Mirrodin was revisited in the set/block? Where do you think the Phyrexians will strike next? Do you think Phyrexian Mana was a mistake? Do you think more cards with Phyrexian Mana will be banned?